Home » Education » Should You Live at Home While Attending College? Perhaps the biggest consideration when making this decision is cost. When you live at home, your meals are taken care of, you have access to free laundry facilities and you don’t (usually) have to pay rent. As a result, it’s pretty easy to save money while attending college. A university education is becoming almost prohibitively expensive, as evidenced by recent reports that show that student loan debt has now surpassed credit card debt. If you are concerned about reducing your college costs and avoiding student loan debt as much as you can, sticking close to home and living at your parents’ house may be the way to go. Of course, money isn’t everything. There is a college experience to be had. Many consider it a rite of passage. It’s hard to get a true college experience when living at your parents’. On top of that, what about learning to live on your own? While living at college isn’t exactly the “real world,” it is an intermediary step between being totally dependent on your parents and developing your own financial independence. Living away from home while in college (even if your parents are only 20 minutes away) can be a good learning experience — and one that can help you begin to manage your own financial resources. Another consideration is the time you spend commuting. If your parents live five to 15 minutes away from the university, the commute probably isn’t such a big deal. However, if you live more than 15 minutes away from your school, the commute can start to become wearing. That commute is time you could be studying or working, helping you make the most out of your college dollar. Don’t forget the gas money you will have to spend, as well as the wear and tear on your car. If you want to live at home, but have a bit of a commute, it might be wise to try and arrange your classes on two or three days of the week to increase the cost efficiency of your commute. If you decide to live away from home, there are some ways to reduce your college living costs. You can rent a room in a house with other students close to campus. You can also check with on campus housing for inexpensive dorm rooms. Instead of getting a meal plan that covers every meal, you can consider getting on or off campus housing with a kitchen. Or, if you have a non-cooking dorm, it is often possible to get a micro-fridge (a mini-fridge with a microwave on top) for some of your meals. Keep cereal (hot or cold) and milk handy for breakfasts. One move I made was to work part time (dinner!) in the college cafeteria. That provided me with one meal a day. I was also a resident adviser for two years, and was able to get free housing that way. Look into what types of jobs are available that can help you save on college living costs, while providing you with a little extra cash. In the end, the decision to live away from home during college is a big one. Examine your situation, and run a cost-benefit analysis. Then decide what works best for you. I’m not a big fan of “dorm life” but LOVED living away from home off-campus. I’m also a big fan of working through college. The independence and responsibility of living on your own (especially living with roommates) is a course in and of itself – and worth the cost of “tuition” (rent and utilities v. living at home costs) in my opinion. But controlling/limiting those costs is key. I”m debating whether I should live off-campus next to my university for my final semester. 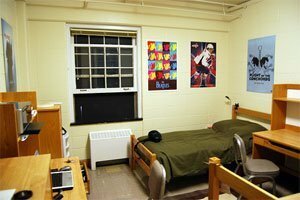 I have always wanted to live in the dorms, however my university gives priority to freshmens and I was a transfer junior. I have one last chance to live off-campus. I think the experience of being away from home is very important. You learn so much by being away from home. It may cost more money, but, I believe that everyone should get to experience college life away from home. If they are able to of course. You learn so much from interacting with people in the dorm. You learn about living on your own. You gather experiences that can’t be replicated at home living with your parents. You miss out on too much be living at home. Honestly, my least favorite aspect of college is so-called “dorm life.” I don’t want my kids to be forced to give up privacy and do without sleep unnecessarily — I’d prefer they have the ability to focus on education if they want to do so. I live in a nice-sized house off of campus now, and it’s just way more comfortable, I’m able to focus on my education, and keep everything in perspective. Based on a financial stand point, living at home through college is the smartest money saving decision you can make. You can commute, get the comfort of your own home, choose to stay with friends occasionally and have more money in your pocket. People could argue that you need to move away and be independent and get the “college experience,” but college is what you make of it. In my opinion, what you take away from college depends on what you put into it. In Europe, most young people live at home through school and until they get married. Sure, it’s because they have strong family ties, but it’s mostly to do with being financially responsible. Why spend extra money when it’s not neccessary to move away at that time in your life when you have the option to stay at home and have more money for your future when it will really matter? I recently graduated from college and I would’ve saved so much money living at home and commuting! Our son attended university in the same town where we live, and even though the university had too many incoming freshmen to even house them all and were begging local students to opt out (offering incentives, even), and it would have saved thousands in room and board, we paid for him to stay at the dorms anyway. It’s part of college, and it was worth it for both him and frankly for us, too. After the first year, he started saving money by rooming with friends in a house, but that still beat (in his mind and ours) having to move back home with us. I know not everyone can afford that choice, but I’ve never once regretted the extra expense and I know our son has appreciated it. If you can stand living with the folks – do it and save some money. Just beware that if you overstay your welcome they might want to charge you rent. Plus, living at home means Mom and Dad are still going to expect you to help with dishes and cut the grass. But good advice for college kids on cutting back on tuition. I remember having the 3 meal a day plan and probably averaged one meal a day in the cafeteria. Going to school close to home, living there and getting a part-time gig was one of the best decisions I made looking back. No college debt and was able to start ahead of the game! I’m a big fan of moving out and being on your own. Not matter the cost. College is a time to grow up and experience things without being attached to your family. You can’t put a price tag on life lessons.